"Lots of sources saying horrible things about #GreeceReferendum outcome. Having trouble finding some that rationalize the "Oxi" vote. Links?" Many cite the Euro as the major cause. The claim is that the Euro as a currency doesn’t really work across a set of countries with as diverse economic situations as Europe. There are some standard ways to respond to economic collapse—for example, devaluing the currency to make exports/tourism cheaper—but Euro zone countries like Greece cannot do this because that would also devalue the currency in wealthier nations, such as Germany. Helpful 3 minute video explanation /HT @Paulmicha This best cases for "no" and "yes" piece /HT @rsbrown argues the same. Ending Greece’s Bleeding /HT @Paulmicha goes so far as to suggest that a "Grexit" (Greece leaving the Euro zone) is actually the best of all the bad options now. And while North America has always had the concept of "have"/"have not" states/provinces, with the better off subsidizing the less so, Canada and the United States are each their own countries ("Americans first, Oregonians second"). The Euro zone, in contrast, is comprised of individual countries, with a strong sense of nationalism ("Germans first, Europeans second"). See Seven Greek Myths /HT @tvnweb for an argument that it doesn't need to be this way. There was also speculation among many that the proposal put forward "troika" (European Commission, European Central Bank (ECB), and International Monetary Fund (IMF)) was actually a thinly-veiled attempt to overthrow the democratically elected, far-left "Syriza" party that has been in power in Greece since January. A "yes" vote (in support of the troika's deal) would've spelled doom for the government's stated anti-austerity platform, and shown alignment with the big banks. How I would vote in the Greek referendum /HT @rohan_p spells out this dilemma. It's the Politics, Stupid! /HT @chx echoes this speculation. Several articles also express suspicion that those protesting on the "yes" side seemed a little too uniform, and a little too cashmere-covered (smacking of political/economic elite, oligarchs, and their brethren), versus the "no" side being more reminiscent of a true grassroots movement. The "yes" side strongly pushed a fear/apocalypse agenda, which was viewed cynically as serving the interests of the big banks and rest of Europe, versus Greeks themselves (in particular, impoverishing the elderly even further was seen by many as impossible to bear). Human Misery vs. Profits: What’s Happening in Greece /HT @dead_lugosi and did the just Euro die at 4pm? /HT @chx go into this discrepancy. TL;DR Greece has "been there, done that" with very large sums of money with very large strings attached, and they've only seen things get worse for their country (and that large sum of money largely flowing out of Greece and into other European economies). The Euro doesn't provide enough flexibility for countries in Greece's predicament to do textbook recovery measures, making already bad economic situations worse. The deal proposed by the creditors was seen by some as a way to force power out of Greeks' hands and into banks' and other European countries' hands, which particularly didn't play well in the birthplace of democracy. There's also a hope that a "no" vote will provide Greece's elected government with a stronger negotiating position with the banks (though this definitely remains to be seen; the troika has much more incentive to make an example of Greece than work with them at this point, or they could see this pattern spread throughout the EU). Just at the start you said "Greece's decision to turn down a referendum". - Greece held a referendum, which is a public vote on a particular policy or constitution change. The appointed Eurogroup finance ministers certainly don't like that, since they can't turn to their electorate for backup. Politicians often have to make unpopular choices to get things done, so going to popular vote is seen as a betrayal of political dealing/negotiation. And basically, Europe leadership tends to ignore referenda anyway. Eurogroup ministers probably saw this as a "populist game" (Juncker, EC President*), but then again, it's a populist party, and Syriza proved it's point. They are acting on the mandate from their people. Which is what very few European leaders have been willing to do. And what the technocrats in Europe don't have to do. You can find his comments from today at https://www.facebook.com/RBReich/photos/a.404595876219681.103599.1424740... and it's pretty much the same thing. 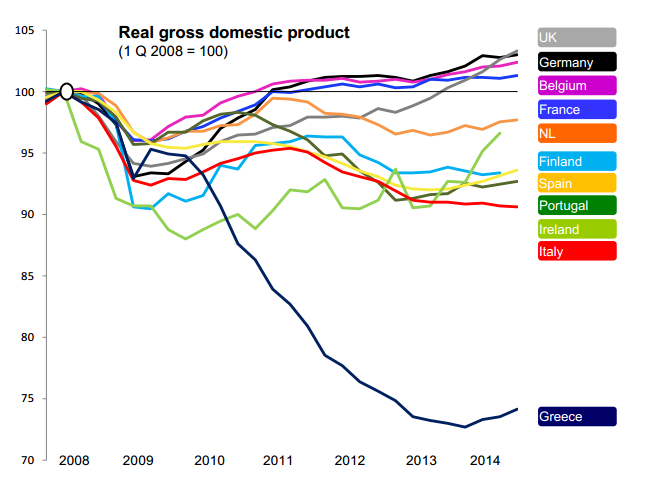 Greece did the right thing, and even though it's not ideal, decoupling form the Euro would provide relief.